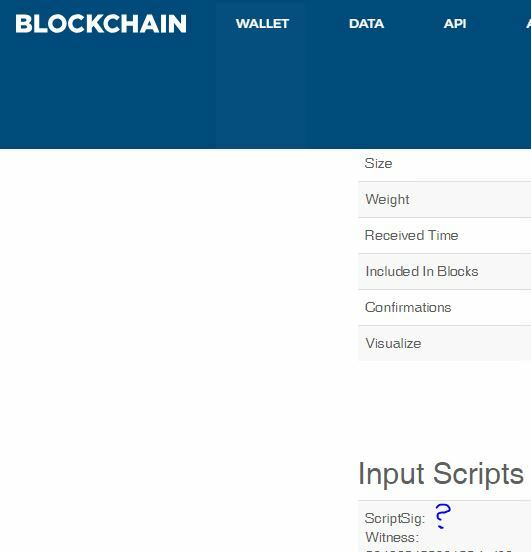 Anyone knows what does it mean when there is no ScriptSig under INPUT SCRIPT for a TX? It seems to be a witness transaction according to your screenshot (you can see the same missing scriptSig followed by witness here). Segwit encodes the signature information slightly differently from the regular script sig, so it will not show up under that heading. A segwit transaction would still contain the information you would traditionally see in the scriptSig, but in the witness section instead. What informations are contained in a transaction?